Paick BL45 Projector, Bring you Big-screen Viewing Experience! 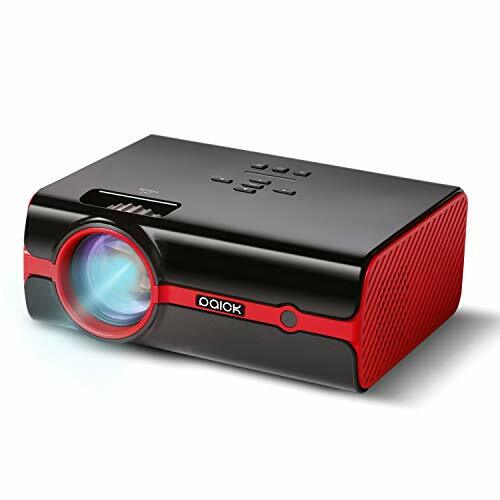 Home Cinema Projector -- Upgraded 60% brightness, 180" display size, compatible with 1080p videos, manual focus with ±15°keystone correction, easy to provide a real cinema feeling when play videos, watch movies, play games or watching live sport competition. A great surprise for kids to watch cartoon movies- Bring them more joy while protect eyes from TV or smartphone. Create A Sweet Movie Night - No need scree, just project the movies on the wall of your living room or bed room, release the stress from work, just relax and enjoy movies with your lover. Compatible with MAC/PC/Laptop/Tablet/Phone/DVD Player - Comes with a free HDMI cable to connect the projector to your device, a lightning to HDMI adapter is required for MAC. Please make sure your phone supports MHL function and connect to the projector via premium MHL cable for stable connection. Rich Interface For The Best Enjoyment - HDMI/USB/VGA/AV/Audio/SD/Headphone port to meet your different demands. Please note the USB port can only connect USB flash driver. Built-in Speaker - More convenience to enjoy videos and movies, you can connect an surround system for better and loudly sound performance. Ups to 50000 Hours Lamp Lifetime - The advanced LED technology makes the lamp a long working time, durable, environmental protection and energy saving. Wonderful Big-Screen Viewing Experience: Upgraded 60% brightness, brighter than other ordinarily projectors in the same price due to the advance LED technology. Max. 180" big-screen size, 50000 hours lifetime lamp, 2200:1 contrast and HD 1080P supported, provides vivid,crystal clear and sharpness image for videos/ movies/home theater or live sport competition. Home Cinema Projector with Stereo Speaker: Designed for home use in dark environment, not only 180" big-screen, it also supports 4ft - 16.5ft project distance, front/rear mounting, ±15▫ manual keystone correction to meet your different demands. The built-in speaker provides excellent audio support, for better and loudly sound performance, please connect an external speaker via HDMI or AV port. Please note this projector DOESN'T SUPPORT Dolby Audio. MAC/PC/Laptop/TV/DVD/SD/Tablet/Smartphone Attachable: Easy to connect MAC, PC, laptop or smaprtphone via HDMI cable in the package or extra HDMI adapter(MAC book needs lightning to HDMI adapter), connect smartphone with MHL function via premium MHL cable, attach a USB flash driver via USB port directly or just insert a SD card to the projector. Support headphone as well. 2 Years Risk-free Warranty: We provide 2 years hassle-free warranty for replacement or refund, and lifetime customer service and technical support for any concerns. Please note the projector is Not recommend for PPT/EXCEL/ WORD,/TEXT OR ANY PRESENTATION.